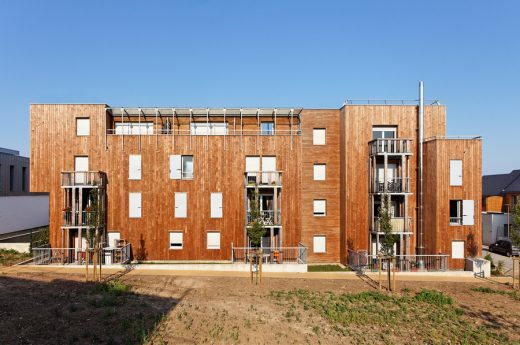 These residential buildings are part of an ambitious urban study for the creation of a new town center – the Zone d’Aménagement Concertée (ZAC), a special planning district known as the “Heart of the City” – in this northern French town of 12,000 inhabitants. A vast area of land was made available before beginning this urban development project, which comprises a diverse range of residences and services surrounding a landscaped public park. 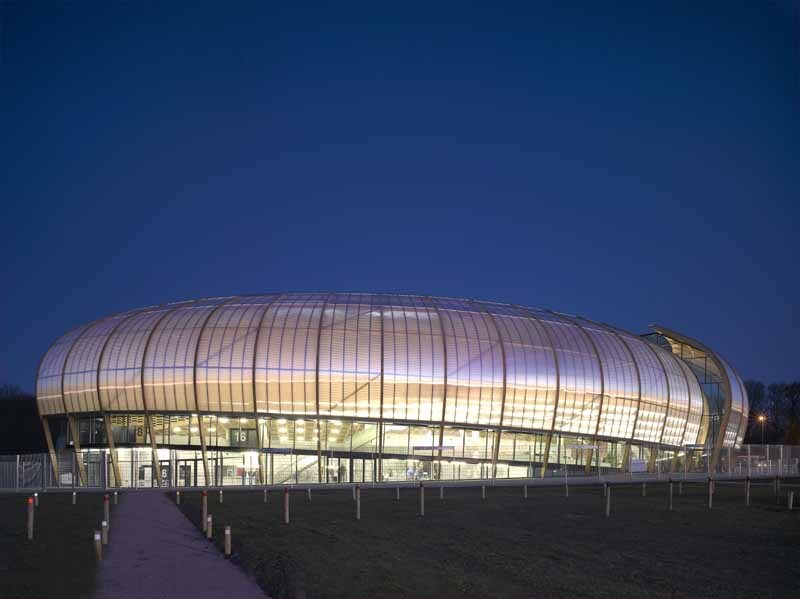 Saint-Genis-Laval has developed hand in hand with a dynamic, innovative social housing policy. The purpose of Les Platanes is to provide accommodation for travellers who have been sedentary for the last thirty years. This project, both in its design and its urban character, comprises a subtle equilibrium of collective considerations and private life, in a spirit of receptiveness and attention to human needs. A striking facade, grounded by a common base line just above street level, with a serrated roofline and randomised cladding punctuated with deep yellow L-shaped incisions. Text from the architects, rather enigmatic…indeed obtuse! In order to hold its place efficiently within the urban fabric its architecture is simple and takes advantage of the sheer size of a 60 apartment’s construction. Size matters when it comes to achieve a dense city. Simplicity and some uniformity contribute to the appeal of residential buildings. The specific color of the facades helps assert the presence of the building. A new, ecological and social living space geared to the 21st century. The project’s richness and major interest lie in the possibility of inventing an urban lifestyle set in a highly experimental framework enabling the affirmation of new ecological and contemporary architectures. The diversity of architectural propositions and communal and private spaces had to ensure and enhance this specificity. The first stage was to ‘sculpt’ the volumes in order to exploit their urban potential and intrinsic spatial qualities. We directed our research towards a hybrid typology combining the house and the apartment. This project is part of an initiative by the city of Grenoble, which had asked a number of architects to propose projects for buildings that would be forward-looking in terms of sustainable development, in order to complete the construction of the final blocks in a new district in the south of the city. Hybrid model between collective and individual housing in Mouvaux. New constructions’ urbanization potential and their capacity to integrate the history and the morphology of the city hosting them constitute the major challenge for new built-up areas. Our strategy takes into consideration this point and other themes as town houses, cars, definition and hierarchical organization of public and collective spaces as well as environmental quality. They are integrated into the project to produce new sustainable urban models. Located at the intersection of the homogeneous and haussmannian landscape along Gossec Street, and of the disparate architecture made up through time on Picpus Street, the site on which this 63 social housing program is established is an element of a typical “collage-city” landscape, also characterized by a double movement of the natural soil: the connection, on its front part, to the deep slope of the Picpus Street, and, on its backyard limit, to a landmark garden, 1.50 m higher than the average level of the soil.